The whole school joined together to celebrate our love for reading. 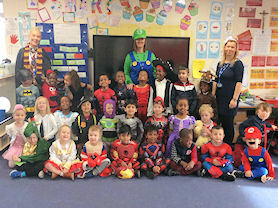 All of the children were invited to come to school dressed as their favourite character and it was lovely to see the effort from all to promote this cause. In EYFS, children were happy to discuss their chosen character and took part in circle time activities where they shared their favourite books. In KS1, the children redesigned the book cover for their favourite story and drew ‘selfies’ of their chosen character. In LKS2 we focused on work based around different authors. 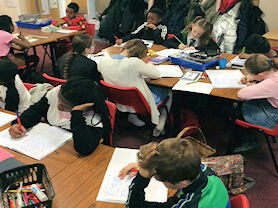 The Year 4 children particularly enjoyed learning all about Charles Dickens and writing a story about children escaping the dreaded workhouse. In UKS2, the children also focused on their favourite books and authors with Year 6 producing book reviews for Harry Potter. It was truly lovely to see how much the children at St. Margaret Mary’s are inspired by authors and stories! 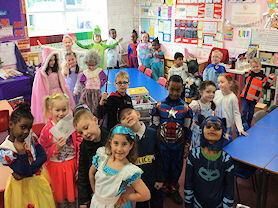 The EYFS costumes looked fab! Key Stage 1 children showing off. 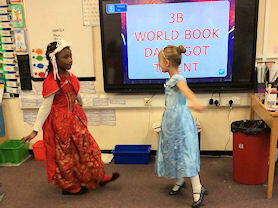 Year 3 acting out their characters. Year 6 writing Harry Potter reviews.